Do not stop using this medication without consulting your doctor. Serious (rarely fatal) withdrawal problems may occur if this medication is suddenly stopped. Get medical help right away if you have any signs of a withdrawal reaction, including: itching, numb/tingling skin, high fever, mental/mood changes (such as confusion), seizures, worsening muscle tightness/stiffness, signs of kidney problems (such as change in the amount of urine). Tell your doctor if you ever had a withdrawal reaction from baclofen. Keep all appointments for refilling the pump to avoid any serious withdrawal problems. Your doctor or another health care professional will check that the pump is programmed and working properly during these appointments. If you must miss a refill appointment, contact your doctor right away to reschedule the appointment before you run out of medication. Also, learn what your pump alarm sounds like. If you hear the alarm, contact your doctor right away. Who should not take Gablofen Syringe? 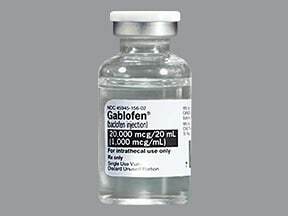 Baclofen is used to treat muscle spasms caused by certain conditions (such as multiple sclerosis, cerebral palsy, spinal cord injury/disease). It works by helping to relax the muscles. 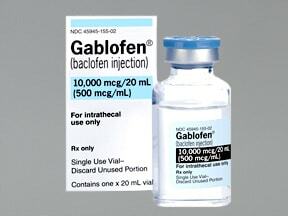 Baclofen injection is used by patients who do not respond to or who cannot tolerate the side effects of baclofen taken by mouth. This medication is given by injection into the space around the spinal cord (intrathecally). It is usually given using a drug pump implanted under your skin. A health care professional will fill and refill the pump with medication. Do not stop treatment with this drug without consulting your doctor because serious withdrawal symptoms may occur. See also Warning section. To prevent withdrawal reactions, your doctor may reduce your dose gradually. Consult your doctor or pharmacist for more details, and report any withdrawal reactions right away. Tell your doctor if your condition does not improve or if it worsens, or if you have any signs of infection (such as fever, chills, redness/swelling/pain/warmth at the pump site). What conditions does Gablofen Syringe treat? Drowsiness, dizziness, weakness, headache, constipation, nausea, or vomiting may occur. If any of these effects persist or worsen, tell your doctor or pharmacist promptly. Tell your doctor right away if you have any serious side effects, including: mental/mood changes (such as confusion, depression, hallucinations), numb/tingling skin, vision changes, difficulty urinating. Get medical help right away if you have any very serious side effects, including: seizures, trouble breathing. List Gablofen Syringe side effects by likelihood and severity. Before using baclofen, tell your doctor or pharmacist if you are allergic to it; or if you have any other allergies. This product may contain inactive ingredients, which can cause allergic reactions or other problems. Talk to your pharmacist for more details. Before using this medication, tell your doctor or pharmacist your medical history, especially of: recent/current infection, seizures, mental/mood disorders (such as schizophrenia), kidney disease. What should I know regarding pregnancy, nursing and administering Gablofen Syringe to children or the elderly? If someone has overdosed and has serious symptoms such as passing out or trouble breathing, call 911. Otherwise, call a poison control center right away. US residents can call their local poison control center at 1-800-222-1222. Canada residents can call a provincial poison control center. Symptoms of overdose may include: severe drowsiness, slow/shallow breathing, seizures, severe muscle weakness, loss of consciousness. Keep all of your appointments to refill the medication. If you plan to travel, talk with your doctor ahead of time about your refill schedule so you do not run out of medication while you are away from home. This drug is to be given continuously as an infusion. If your infusion is interrupted, contact your doctor or pharmacist right away. If you miss an appointment to refill the medication, contact your doctor right away to reschedule before the pump runs out of drug. 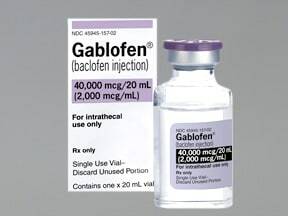 Are you taking Gablofen Syringe? 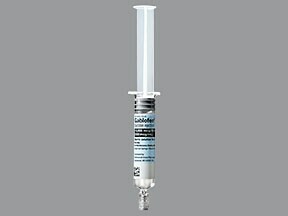 Are you considering switching to Gablofen Syringe? 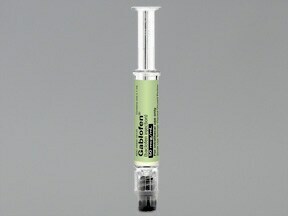 How long have you been taking Gablofen Syringe?